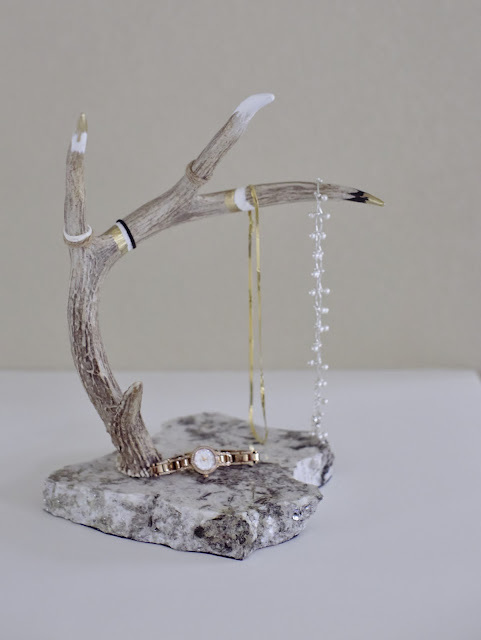 I loved this project! 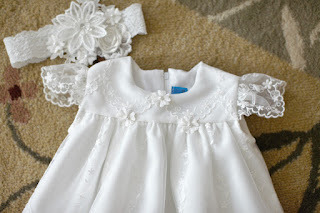 Of course, I love flower girl dresses to begin with, but because this one was so very different than many that I've created it was especially fun. This little boochkie (that's my own word) will only be 16 months old for the wedding so it was literally like making doll clothes. The bride had found a couple of styles she liked which featured an embroidered organza fabric with a scalloped edge at the bottom. 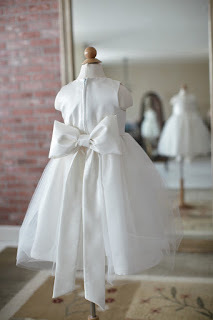 The style was very simple; raised yoke with the skirt of the dress gathered from that point. It truly was the fabric that made this style so unique. After searching for quite some time, I found the fabric online. With fingers crossed, I placed the order. I was hopeful it would be as beautiful in person as it was in the picture....whew....it definitely was! I started making the pattern one day and just couldn't stop! I was so excited to see it come together that I just kept going and hours later it was cut out and partially sewn, and it was looking just like I'd imagined. One of the really cool processes was "engineering" the fabric; meaning working with the design within the fabric to really highlight the embroidery. 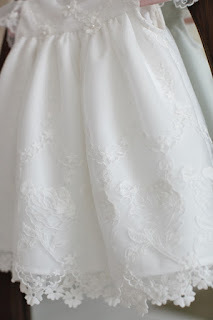 The scalloped edge was obviously reserved for the bottom of the dress, but the proper placement of the yoke and sleeves allowed me to accent some of the other elements. So fun! 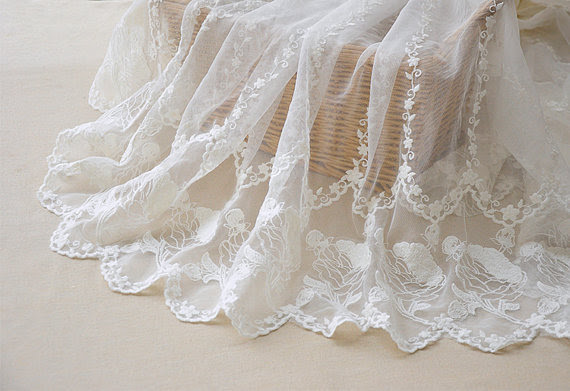 I added an extra layer of a venice lace to the lining to create a second tier of flowers and cut out some of those very same flowers to use on the yoke as well. And of course, who can resist a matching headband? 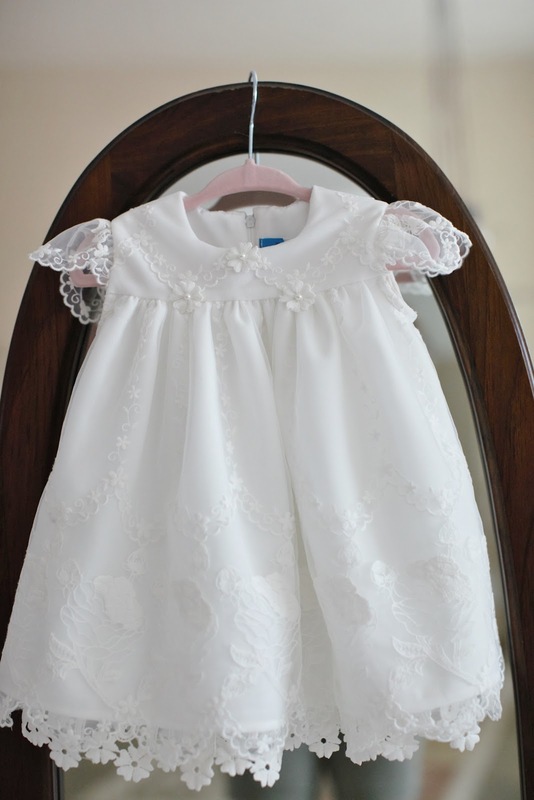 I'm so excited to see pictures of little Miss Clementine in the dress! I'll upload those to my website when I get them. Oh my Italian goodness!! This recipe was heavenly. 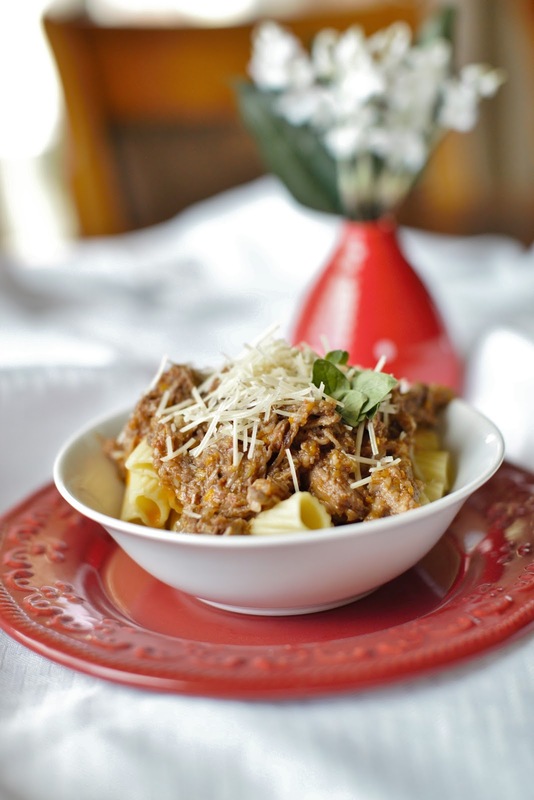 Rich meat sauce exploding with flavor; a departure from the usual tomato based Italian sauces. Absolutely delicious! Know that you have about 30 minutes of prep...but after that, it all goes into the crock pot and you have an absolutely scrumptious meal about 6 hours later. Oh, and the house smells wonderful as it's cooking. There also is a point in the prep where you do need a food processor. I just recently bought a small version and am loving it! Sprinkle the beef with 1 tsp. salt and ½ tsp. pepper and place in the bottom of a 6-quart slow cooker. Pulse the onions in a food processor until finely minced, about 15 pulses, scrape the sides of the bowl as needed. Transfer the onions to a large bowl and stir in ¼ tsp. salt. Cover and microwave for 5 minutes. Drain the onions in a fine mesh strainer, pressing with a rubber spatula to extract the excess liquid. Return the drained onions to the now empty bowl. Process the pancetta, salami, carrot and celery in the now empty food processor until ground to a paste, about 45 seconds, scrape the bowl as needed. Transfer the pancetta mixture to the bowl with the onions. Stir the wine, water, 2 Tbsp. of the olive oil, tomato paste, oregano, 3/4 tsp. salt, and ½ tsp. pepper into the onion mixture until thoroughly combined. Pour the onion mixture over the beef, covering completely. Cover and cook until the beef is fully tender (8-9 hours on low or 5-6 hours on high). Cook the pasta according to the package directions. Reserve ½ cup of the water prior to draining. Using a potato masher, mash the meat until coarsely shredded into bite size pieces. Stir in the Romano cheese and the remaining 2 Tbsp. olive oil. Thin the sauce if you feel it needs it using the ½ cup reserved water. Note: The original recipe suggested placing the cooked pasta into the crock pot and mixing it with the sauce. 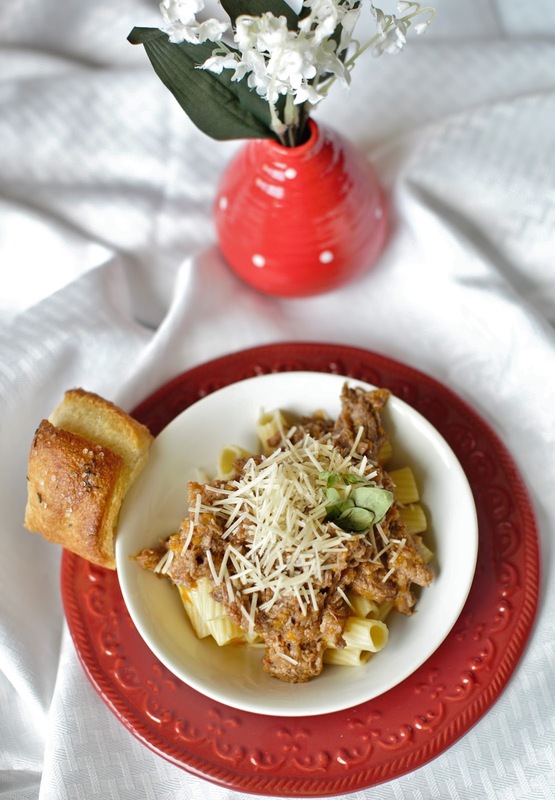 I chose to spoon the pasta into individual serving bowls and ladle sauce on top for each portion. Macerated berries is so easy to prepare, and offers a beautiful presentation for dinner guests. A perfect summer dessert loaded with fresh berries! 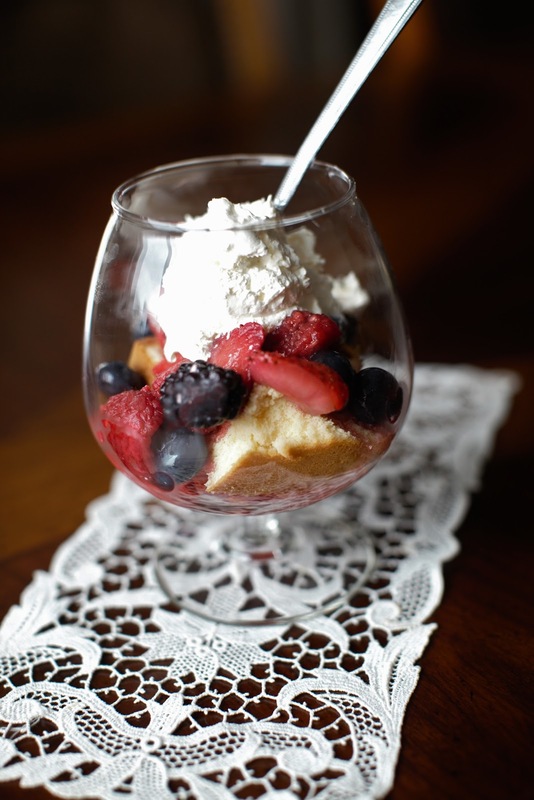 A couple hours prior to serving add the fresh berries to a bowl and toss with lemon juice, sugar and Amaretto. Refrigerate. Don't prepare in advance much longer than that since the berries will get overly soggy. Add your choice of cake to the bottom of the serving dish. Spoon over the berries and add a dollop of whipped topping. The Amaretto offers just the right almond flavoring to the berries. So light, and flavorful! This was the perfect dessert after I served a meal of blackened mahi mahi with fruit salsa, rice pilaf, and sauteed zucchini and squash in lemon butter sauce. 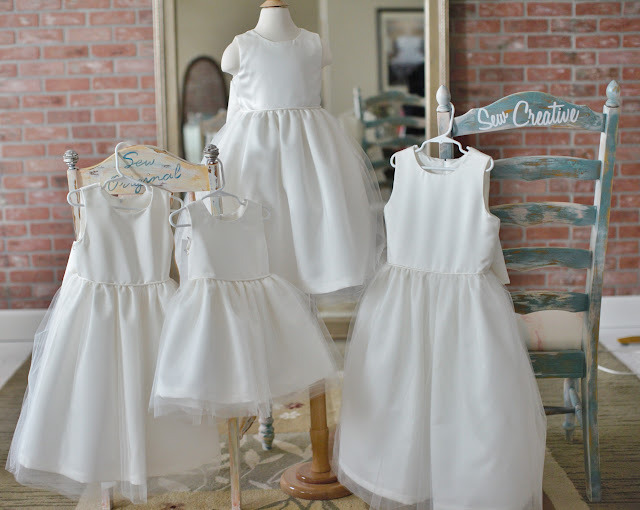 I was thrilled to be asked to design and sew dresses for four cousins who were reprising their roles as flower girls. Last summer, they were flower girls for my Son/Daughter-in-Law's wedding....this year it's a cousin and it's been close to a year later. So, it was fun to see how they've grown. The Bride was looking for a classic style. After sending her four different sketches, she landed on this one. 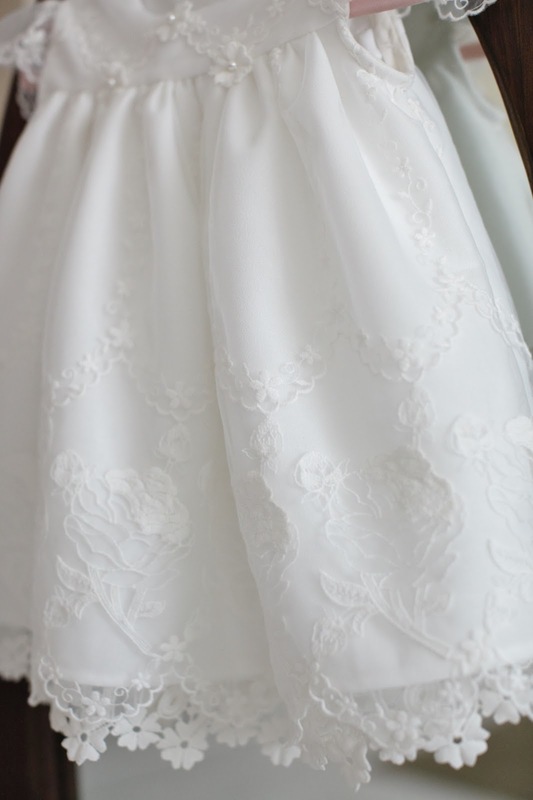 An off-white satin with five layers of tulle over the skirt. 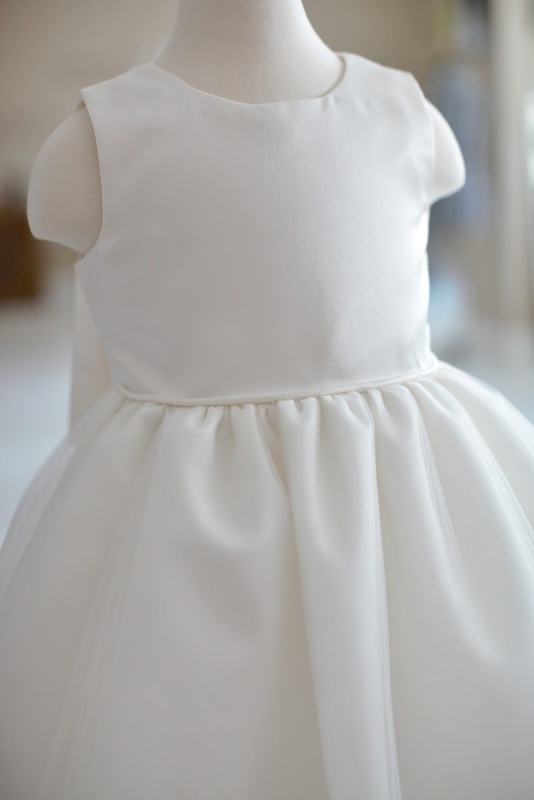 Even the waistline was kept simple, with a a classic piping. 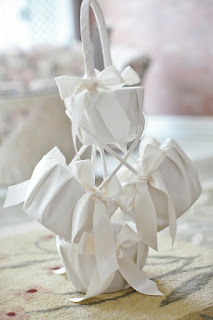 But, I had to add "a little party in the back" with an oversized candy box bow! The bows are pre-tied to ensure a picture perfect bow. 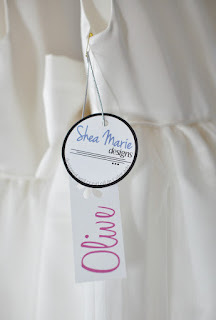 I attached them to the dress on one side and the other side attaches with velcro. Easy Peasy! The two middle cousins are really close in age and size. The oldest is about 8 and the youngest is 18 months. 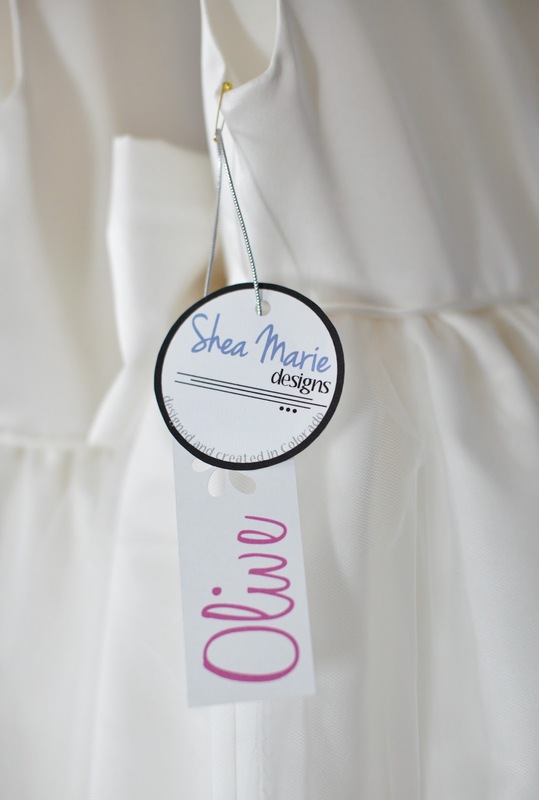 I added a hangtag with my label and their names (Josie, Olive, McKenzie and Hazel) to personalize their dresses. I also made them matching baskets from the same satin as their dresses. With large bows at each handle. Again, simple and classic. My son sent me a cell phone pic so I could see them in their dresses. They looked so cute, and better still....they all fit great! When I get the professional pics, I'll be uploading them to my website. I've been so anxious to share this.....it was an ambitious project with lots of steps along the way, but the finished product is so awesome, it was so worth all the elbow grease and muscle used in the process. This project was a labor of love for our daughter. She needed a bedframe and spotted something at American Furniture Warehouse, but the sucker was so huge there was no way it would fit up her stairs. So, of course, I said "we can make something like that for you". 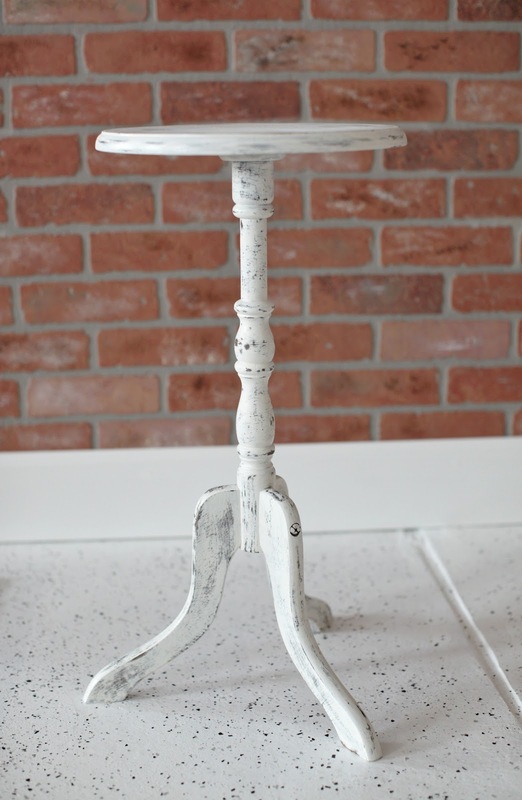 It was a rustic piece, so I knew I had distressing mastered after working on multiple projects. And.....I felt by using old doors we could create something similar at a fraction of the cost. Oh....and it would fit up the stairs! So, first stop was ReSource in Boulder a great place to pick up reclaimed building materials. My daughter and I took a "field trip" and as luck would have it, we found two matching doors. Perfect! Since we knew she wanted both a headboard and footboard. We tagged them and two days later my husband and I picked them up with his truck. Now, I have to tell you, these suckers were/are beyond heavy. They are solid wood exterior doors. The next step was all me......sanding, and sanding, and sanding. The doors were really worn with all sorts of gunk on them, including bird droppings. 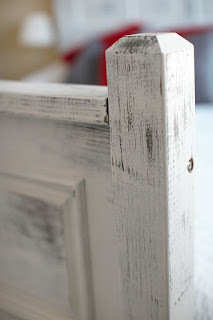 Worn was not a problem, it went right along with the rustic theme, but the dirt and grime would have to go! Next up, painting. I first went with the grey that my daughter had picked out. After the two coats of grey had dried, a "whitewash" of white paint was applied. As you can imagine, this took time. Although, I have to see the 90 degree weather made for an accelerated drying time. 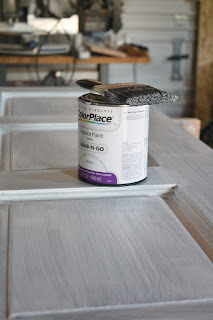 After both sides of a door was painted in both colors. The distressing began. So, back to sanding to allow for the grey to peek through and create a weathered look. There's no science to this, I just know it when I see it. 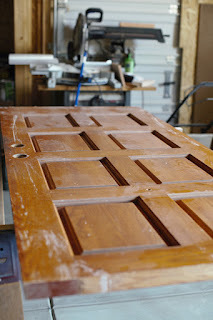 After I had finished both doors....it was back to my husband. We purchased 4x4 posts and a couple of 2x4's. 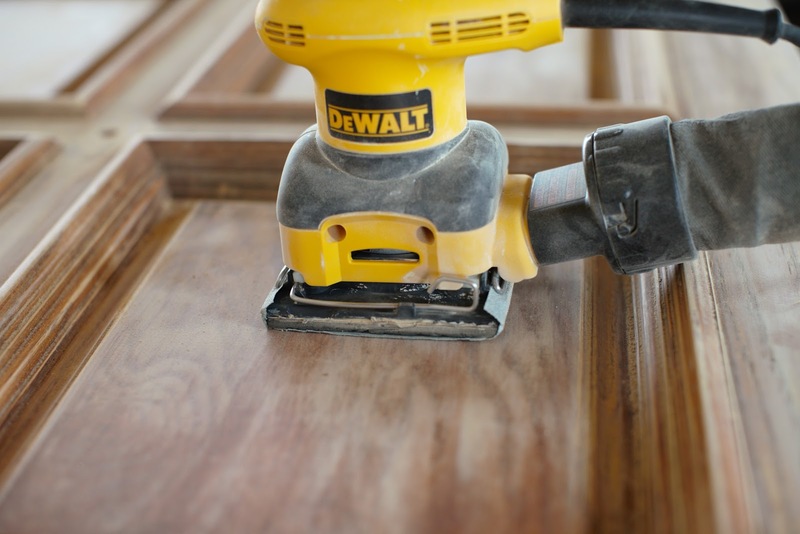 He rocked it when it came to creating my vision for the posts and the "ledges" for the tops of the doors. He was even able to put a finishing edge on the posts that was just what they needed. Next up, a couple days worth of painting and distressing the posts and 2x4's. Okay.....so now, we need to transport these to our daughter's house. My husband figured it would be easier to transport to her house and up her stairs, unassembled. So that's what we did. We delivered them to her garage. 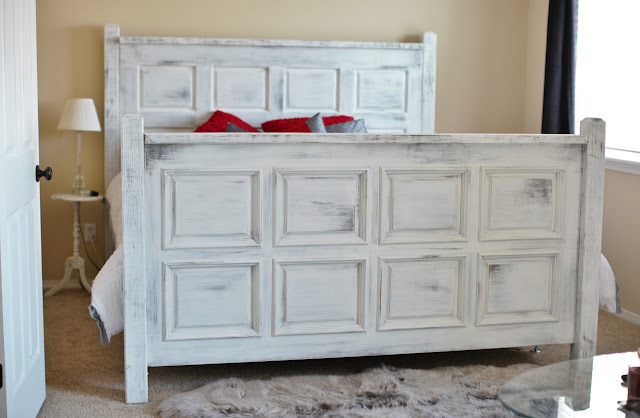 Headboard and Footboard separate from the posts. Then, it was up to her to find some burly guys to help her get the doors up the stairs. Did I mention how heavy these suckers were? Yeah.....so, that's why we bailed. Getting them on/off saw horses and in/out of the truck is one thing. But carrying them up stairs. No thank you. Once they were muscled upstairs, my husband and daughter put everything together. She is absolutely ecstatic! That in and of itself makes all the work worth it. But still, I have to say I'm really proud of the finished product. This truly was a "his, hers and ours" project from start to finish! In case you're wondering, the bedframe at AFW was $555, this came in at just under $150! (that includes the metal bedframe the box springs and mattress sit on) The bedroom is starting to come together. I also distressed the table next to the bed to match the bedframe. It had been painted over the years to a dark brown. 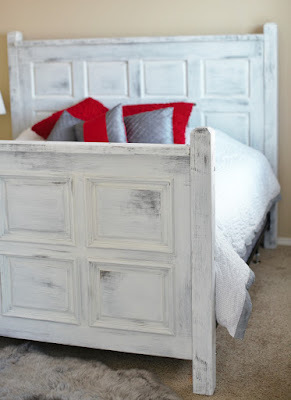 I used the same process for distressing as I did the bed. 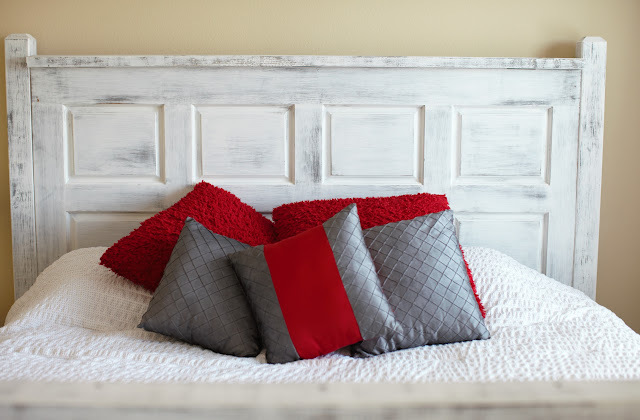 The color theme in the bedroom is red, grey and black. A few accessories here and there, maybe a few touches for the walls and it will look fantastic!